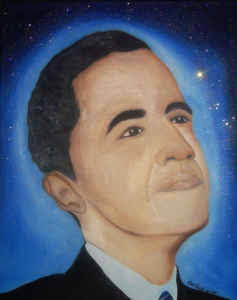 theAd>>FOR SALE IS AN ORIGINAL OIL ON CANVAS PAINTING OF PRESIDENT ELECT BARACK OBAMA. THIS IS AN ORIGINAL, NOT A CANVAS REPRINT!!! I AM AN EMERGING ARTIST FROM NEW YORK CITY, OFFERING ONE OF MY ORIGINALS FOR A GREAT PRICE! THE PAINTING WILL BE SOLD WITH AN ORIGINAL CERTIFICATE OF AUTHENTICITY. SERIOUS INQUIRIES ONLY, PLEASE. THANKS!